The 2015 symposium is being hosted by the Department of Astronomy at Williams College, in Williamstown, Massachusetts. The symposium will begin with a reception (beginning 5:30) and dinner (at 7:30) on Friday evening at the Williams Inn, 1090 Main St. Williamstown, MA 01267. Students and faculty will also be staying at the Williams Inn on Friday night. Breakfast at the Inn is included with the room. The symposium will be held on Saturday in the Wege Auditorium, Science Center (room TCL 123). 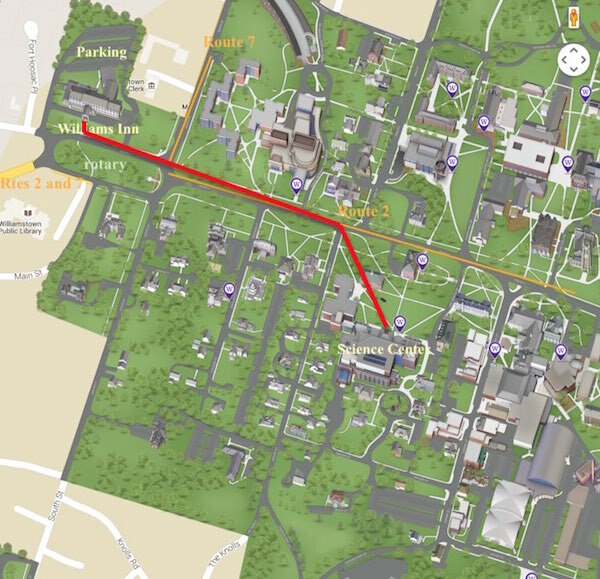 See map below for relative locations of the Inn and the Science Center. The symposium will begin at 8:30 AM with a welcome by College President Falk. Lunch will be provided in the Science Center. You can take a look at the title page, overview, and table of contents of the proceedings and the schedule for the symposium. And a a schedule showing the order of talks. Information for students writing papers is also available. New: You can view the slides from the four lunchtime breakout sessions. New: And photos from the symposium too. © copyright 2015 David Cohen and the Keck Northeast Astronomy Consortium.